The Holy Eucharist is the focus of our Sunday worship. 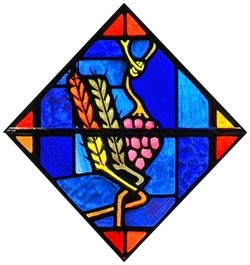 According to the Catechism in the Book of Common Prayer, it is “the Sacrament commanded by Christ for the continual remembrance of His life, death and resurrection until His coming again… The benefits we receive in the Lord’s Supper … are forgiveness of our sins, the strengthening of our union with Christ and with one another, and the foretaste of the heavenly banquet which is our nourishment in heavenly life.” Therefore, when we come to the Lord’s Table, “it is required that we should examine our lives, repent of our sins, and be in love and charity with all people.” Those who do not wish to receive may come forward to the altar rail to receive a blessing. Gluten-free Communion wafers are also available for those with wheat allergies; please speak to our Rector to arrange to receive this type of wafer. It's our tradition at St. Paul’s, remembering Jesus acceptance of all, to include everyone at the communion table, including children as soon as they are able after Holy Baptism. Our main celebrations are on Sunday at 8:00 a.m. and 10:15, with a briefer, simple service on Wednesdays at noon in the chapel. During the summer months, July-Sept, we worship at 9:00 a.m.